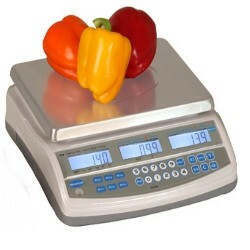 These Brecknell PC-30 and PC-60 commercial retail scales are ideal for farmer's markets, strawberry farms and pick your own berries, fudge shoppes, butchers, or any place where you sell items by the pound. At one time there used to be only one or two brands of these scales but now there are several good high quality choices of legal for trade price computing scales to choose from and Brecknell is one of them. The scale used to be called the Salter Brecknell PC Series but now they just go by Brecknell. The PC-30 includes a 30 pound capacity while the 60 pound capacity is model PC-60. We typically stock both for fast shipment to you. The display shows the weight, price per pound and the total amount of money that your customer owes you. 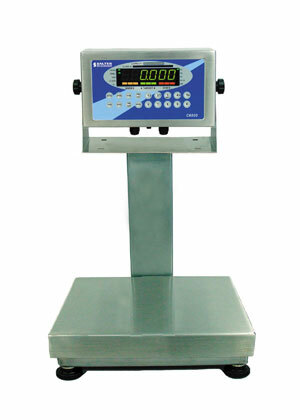 The scale operates on standard AC power or the built in rechargeable battery. We are a top Brecknell distributor so if you're looking for a great price and fast shipping please contact us today by phone or email and we can get one of these PC30 or PC60 scales out to you today via UPS. Known for uncompromising quality for the Independent Retailer, the PC Series from Brecknell is a simple and cost-effective price calculating scale has been developed for independent retailers by Brecknell. The PC series can be used indoors in a candy shoppe or outdoors at a farmers market using 115VAC power or battery power. It has a compact footprint to save counter space and allow easy movement, and features a backlit LCD display, programmable price look up keys, and a weighing capacity of 30 pounds or 60 pounds. Platform size is 11.8" x 9" which is a good size for most applications.